It may not leave a trail of destruction and pew-pews in its wake but NASA's newest atmospheric sensor, the laser-beaming CATS module, could afford researchers a fuller understanding of how our reliance on nonrenewable energy fuels climate change. 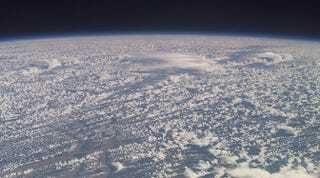 Built by NASA's Goddard Space Flight Center in Greenbelt, Maryland, the Cloud-Aerosol Transport System (CATS) is a refrigerator-sized remote sensor that will attach to the International Space Station in the coming days—assuming that its scheduled launch this morning aboard a SpaceX rocket goes according to plan (Update: it didn't)—to measure both cloud formation and the presence of aerosols, hopefully providing insights as to how the latter impacts the former at each layer of the atmosphere. This isn't the first aerosol-sensing system NASA has put into orbit—it has actually been designed to augment the existing CALIPSO mission, a standalone research satellite that has been operating since 2006. The CATS module will take measurements using three distinct wavelengths of light, including near infrared, as opposed to the two visible spectrum wavelengths that CALIPSO could see. CATS will send a laser pulse through the atmosphere towards a distant object like a cloud droplet or aerosol particle. Once the energy reaches the object, some of the energy is reflected back to the lidar receiver. Scientists can calculate the distance between the instrument and the object, based on the time it takes the energy to return to the receiver, thereby determining the altitudes of cloud and aerosol layers. The intensity of this return pulse also allows scientists to infer other properties, such as the composition of clouds, and the abundance and sizes of aerosols. This will allow researchers to measure the height and thickness of clouds at each atmospheric layer as well as a general idea of what types of aerosols are present within them. "CATS is a groundbreaking science and technology pathfinder," Colleen Hartman, deputy center director for science at NASA's Goddard Space Flight Center said in a press release. "Not only will it make critical measurements that will tell us more about the global impact of pollution, smoke and dust on Earth's climate, it will demonstrate promising new technology and prove that inexpensive missions can make critical measurements needed by the modelers to predict future climate changes."